Home to the famous Williams Lake Stampede, this former "cowtown"has grown into a vibrant city that offers a comfortable blend of urban living and easy going western charm. Situated in the center of this vast region, Williams Lake has earned it's nickname "The Hub of the Cariboo". Bringing thousands of travellers north and south each year, Highway 97 is interior BC's major route for tourism and commerce. Highway 20 travels three hundred miles west from Williams Lake, through BC's 'last frontier', the sprawling ranch land and forests of the Chilcotin, then makes a breathtaking descent to the BellaCoola Valley and the Pacific Ocean. A few miles south of Williams Lake is 150 Mile House, the turnoff to the historic communities of Likely and Horsefly. Follow the original Gold Rush Trail into the foothills of the Cariboo mountians. There you will enjoy some of the regions finest fishing and camping. Population: 10,500 city and 19,720 surroundingregion. Total service area of 30,220. Main Industries: Forestry, agriculture,mining; tourism; transportation; government offices. Climate: July avg. temp is 22 C. (71.6 F).January avg. temp is -10 C (14 F). Access: Located 25 km (16 mi) north of 150 Mile House on Hwy 97. 540 km (348 mi) north of Vancouver. 238 km (148 mi) south of Prince George. The major north-south route is Highway 97. Highway 20 connects with Bella Coola on the coast. Williams Lake is readily accessible by road, rail and air. Passenger service is available on both BC Rail and Greyhound Bus Lines.The airport is located 13 kilometers north of the city. Scheduled airlines include Air BC to Vancouver and Aviair which services Kamloops, Kelowna and Penticton. Charter Services are available from: Canadian Helicopters Ltd.; Sharp Wings Ltd.; Northern Mountain Helicopters; Lawrence Aviation; Highland Helicopters Ltd. 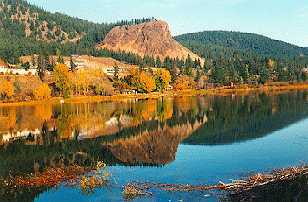 Accommodations: Williams Lake offers a variety of hotels, motels, and bed & breakfasts. Campsites: 40 bay campsite at the WilliamsLake Stampede grounds; full facilities campground outside of town at the southend of Williams Lake; 8 miles north of Williams Lake is another 40 unitcampground with or without full hookups. The outlying lakes offer numerous fullservice private campgrounds and many have free rustic campsites maintained bythe BC Forest Service. Recreation Facilities: Golf courses, swimming pool, tennis, Mini-Golf, curling & skating arenas, parks, hiking trails,auto racing oval, bowling alley, playing fields. Local Attractions: Museum of the CaribooChilcotin; Station House Gift Shop & Gallery; Scout Island Nature Centre; Williams Lake River Valley Trails. Regional Tourism Information for the Williams Lake area.